After breaking four of my beloved long nails I decided to get some falsies, after some research I was set on getting Gel nails - according to some they do not damage your nail as much as Acrylics. I was at Westfields shopping Centre in Shepard's Bush, London when I saw Le Monde Nails. They offer an extensive range of nail treatments, I chose UV Gel - which I had never heard of before. The gel sets under UV light, giving the same effect as Acrylics. The results were beautiful. After the technician applies the false tips, she then paints on the gel. In order for the gel to set it must go under UV lights. I put my hands in the UV light box, the sensation is very strange - the gel heats up very quickly and gets very hot for a split second. When I put my first nail in I found myself pulling my hand out quickly, the heat scared me! It only heated up for a second, so once I got used to the feeling it was fine. The technician who was called Lam was extremely professional and did an amazing job on my nails. The only downside was the language barrier, many of the technicians are forgein and do not speak much English so they don't give you any after care or any facts at all. Although my technician did appear to speak more English than the others, I would have loved to have known how long they last, but I guess I will have to find out myself! (I will update this post when they come off). I chose O.P.I What's with the Cattitude? Nail Polish (Shrek collection) for the colour, which is so beautiful! A stunning 'icy' pastel blue. I ended up buying it because I loved it so much! My UV nails cost £50 and took around one hour. I am in love with my new nails, if only they always looked like this! What do you think? Ever had UV Gel nails? looks soo pretty! Love the color! CHECK OUT MY INTERNATIONAL GIVEAWAY FOR the 88 Palette!! Got UV Nails since 4 years and i love it. A few weeks ago i decided to do it myself. I bought a Set with all tools an I love to do it on my own, 'cause you can choose how often you do it, which shape and the thickness, but I can not recommend it to a beginner, if you do it the wrong way you can damage your Nails so hard. I love your style 'cause ther not getting wider in the front. Love my UV gels -- I get them done with the tips in white gel and the base in pink so its a French manicure and let it that way or get them with polish over them. Acetone won't effect the gel so you can change polish whenever you want. Perfection! Wow the looks great!! Gorgeous color. I want to try to get gel nails you should update us with how long it lasts! your nails looks very pretty and natural. Love the color! 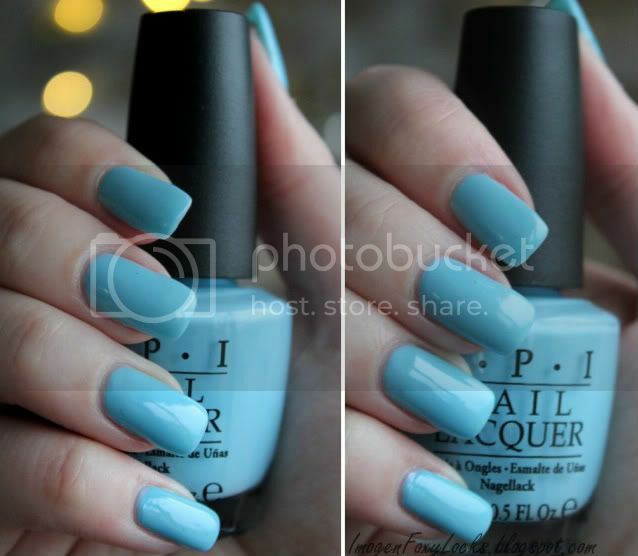 Such a cute color! 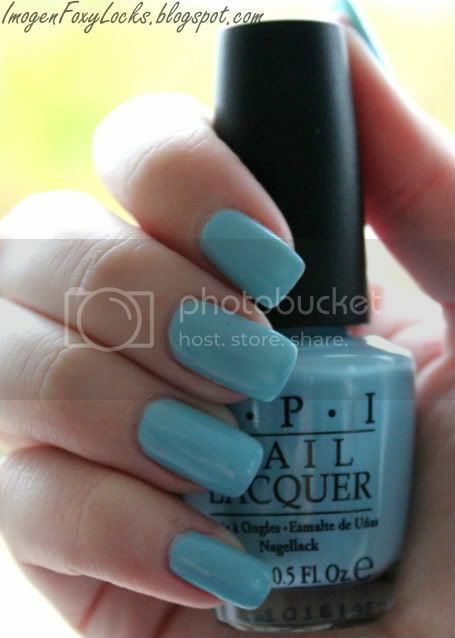 My sister has a bottle that's a little more aqua toned but this one is gorgeous ! I used to get gel nails but they ruin the nails just as much as acrylics, my nails used to be like paper after. super cute girl. :) i've been wanting to try these. They look amazing, and I'm not even a fan of blues but I love this color! hi!good blog,follow us if u like our blog and we will follow you too! Im going to order my first foxylocks extensions soon,and im just wondering the right color. my hear is same that beyonce has on that picture http://www.isabellagucci.com/wp-content/uploads/2008/04/rihannavsbeyonce.jpg soo...can u help me choosing the right color:)? thnx! what a fabulous shade of blue, love it! I love gel nails. Pretty color! !